Ok, Supernatural, is good at angst, emotion and seriously messed up relationships with lots and lots and lots of drama. But this episode turned that to 11. So. Much. Deeply. Unhealthy. Emotion. So, Dean is still planning to lock himself in a magical metal coffin and have himself dumped in the Pacific ocean. He is conflicted about this because he has terrible nightmares about it. He is clearly really really not happy with his suicidal decision. Sam hears this and tries to offer comfort to Dean - but Dean obviously pretends nothing is wrong because he’s Dean. To which Sam assures him it’s ok to be traumatised since he’s planning a fate that is utterly worse than death. Just like, so terrible. Sam is probably quite good at comforting - but then he isn’t trying to be comforting. He’s dumping as much awful on Dean as he can to make him reconsider. They begin their road trip to Dean’s horrible fate, Dean begins to talk about their childhood and how he regrets supporting their dad so much when he and Sam were at odds and how his dad, when annoyed at Dean, used to send him away. And as a long term 14 season Supernatural fan, can I say how much this moment mattered - because here we had Dean, Dean of all people, acknowledging that John Winchester was a less than perfect parent (yes I have always been in camp: John Winchester was an abusive father and Bobby was their real dad). But Sam is not being dragged down painful memory lane, angrily and emotionally shuts Dean down. If he’s going to put Dean in a metal box in the ocean he is not having an emotional recap with him, absolutely not. Sam naturally seizes on this and encourages Dean to go on one last case and it doesn’t take too much of a sell to convince him to come with. They contact Castiel to question who is running around knowing Enochian, suspecting that it may be an angel. Castiel quickly drops that he knows about Dean’s suicide plan (because he’s not great at secrets) and promptly gets on with telling Dean what a terribad awful idea this is. Dean still won’t be shifted. And no they will never ever give up on talking him out of it. So onto the case where they interview the twin of one of the victims who talks a lot about just how much his brother meant to him. Uh-huh this is not subtle. Not subtle at all, these pot shots at their feels. They get a name for the suspect and run it by Castiel to check that angel connection - and find that he’s due to be the next prophet. Which is odd because he shouldn’t be tapped yet since Donatello is still alive - albeit in a coma. They do track down the guy, neutralise him and manage to convince him his religious mania, god-is-telling-me-to-murder-people that he’s actually just a murderer in like… 3 minutes. That was shockingly easy and quick and not in any way a plot contrivance. Duly devastated, he shoots himself which is messy. This is not a good thing. And they decide to make the extremely hard decision how to stop it - Donatello needs to not be on the threshold of life and death. He needs to die. They plan to turn off his life support machines. Yeah we’re back to the not-subtle here. Castiel heals Donatello - and it works, he is awake, fully functioning prophet again. Oh he still doesn’t have a soul, but he’s not dead and no new prophets should be tapped. They celebrate the win and Dean and Sam drink… and have it out. Because we’ve just had a whole not-subtle episode about not giving up on someone! Sam angrily and emotionally that Dean is giving up on them all, that they’re the ones who save the world, don’t check out of it. He talks about what Dean means to him and how Dean is giving up - and he hits him. Between the punch, the emotion and the fact Sam is right - sure Dean is struggling holding Michael but he’s not desperate yet, they have time - Dean agrees to stop his plan. Until they have no choice - but at that point he insists Sam let him do it. I think this was powerfully emotional and basically summed up what the Winchesters have always been - always willing to fight to the last, always willing to battle impossible odds, but, ultimately, they’re martyrs who are only saved from martyrdom by their rather unhealthy codependent relationship. Dean was never going to do this for himself, he was always going to walk to his death no matter how reluctantly - but Sam would never allow it. We saw this in their pained interaction after Dean was sent to Purgatory - Dean was willing to sacrifice himself but shocked and hurt that Sam didn’t burn all the bridges looking for him. Nick is in a hospital and in custody, telling everyone Satan made him kill people and how Lucifer changed him. The guard isn’t buying that and isn’t a fan - but is still too trusting and Nick manages to escape with a lot of really overkill violence. He goes to his old home where his wife and child dies and finds it freezing gold with lots of spookiness. And actual vengeful spirit. 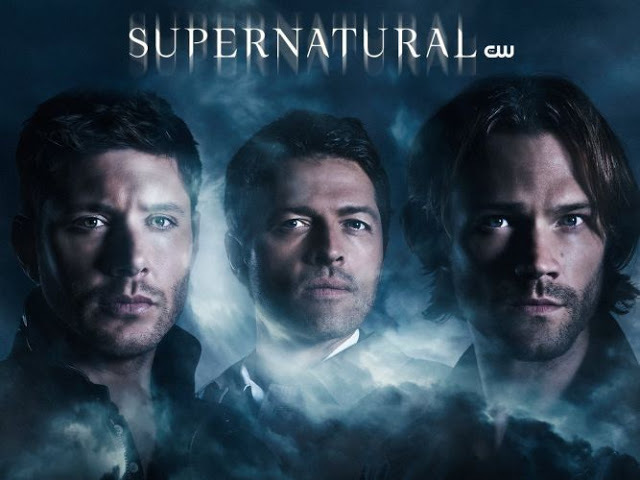 Ok, I admit to having a moment of glee - I really liked old School Supernatural when half the problems were these raging spirits which now all seem just beneath the Winchester’s notice as they face endless demons and super monsters. Vengeful spirits and urban legends were the core of this show. And while originally I was a little irritated, I mean I like Mark Pellegrino but this storyline is DEAD ALREADY, let it go Supernatural. But then, who would be the perfect host for them to dump Michael in before dropping him in a metal coffin and in the ocean? Why Lucifer’s old host seems ideal.